The following interview was conducted by Matthew Pitzarella - Director of Energy, Environmental and Natural Resources Section. 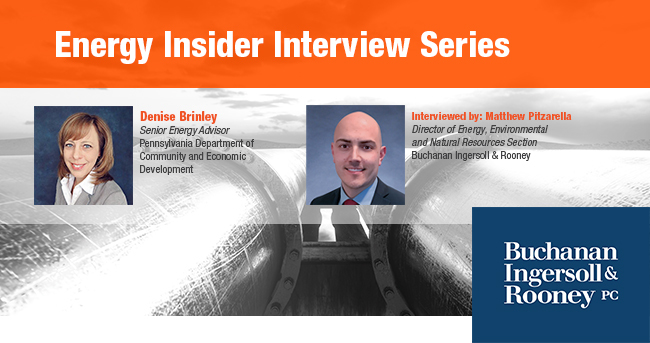 In this edition of Buchanan Ingersoll and Rooney’s Energy Insider Interview Series, we spoke to Denise Brinley, Senior Energy Advisor at the Pennsylvania Department of Community and Economic Development (DCED). She is one of the leaders behind the creation of the new playbook detailing the decommissioning and redevelopment of the Mitchell Power Station and adjacent Canestrale properties located in Washington County, Pennsylvania, right along the Monongahela River. The playbook, which is the first in a series that will analyze nearly a dozen decommissioned power plants in Pennsylvania, was written to encourage potential developers to invest in and redevelop these pieces of land. Each playbook will outline the site specifications and recommend three potential reuse scenarios. We spoke with Denise about the creation of that playbook that our friends at Civil & Environmental Consultants took the lead on, why it’s important, and what else she’s working on with the DCED that affects the energy industry across Pennsylvania and beyond. 1. You spearheaded the drafting of the decommissioning and redevelopment playbook for the Mitchell Power Station and adjacent Canestrale properties in Washington County. Can you tell us a bit about the purpose of developing this playbook and what the Department of Community & Economic Development hopes it accomplishes? When I first came to the Pennsylvania DCED in 2015, we were in—and still are in—what I would call a major energy transition. Coal was beginning to fall out of Pennsylvania’s generation portfolio, which left us with 14 coal-fired power plants that had been decommissioned and left to sit idle. Once a coal-fired power plant is decommissioned, they rarely ever come back online. In some cases, there may be an opportunity to re-power with natural gas, but engineering costs often outweigh the opportunities that come with a re-power scenario. So, the question becomes, can something else be done with this land? We believe that these sites represent some of the best real estate assets in Pennsylvania, primarily because they have incredible infrastructure serving them. There’s river, road, rail, transmission infrastructure. They’re generally served with natural gas, and they’re really prime pieces of land. We wanted to look at ways to help the energy industry move beyond just being owners of mothballed properties and open these sites up to what is next by identifying their highest redevelopment potential. But many of the energy companies that we began working with weren’t really accustomed to understanding how to deal with excess property, at least not in the case of decommissioned coal-fired power plants. They are power generators, not redevelopers. We worked closely with First Energy and Exelon in finding mutually shared goals in developing the conceptual framework of the playbooks. DCED, First Energy and Exelon all wanted to leave behind something of value to the communities in which they once operated. That shared sense of focus on the next generation of development became a focal point of our playbooks. Decommissioned coal-fired power plants are, in a classic sense, brownfields. And there’s always a hesitation to buy brownfields because of potential liabilities. So, we had to make sure that any kind of report that we produced would highlight the positives of the sites but also give developers a view into some of the liabilities that they might face. It was basically doing advance risk mitigation work for them. But we knew we were also walking a delicate line in engaging with power companies and producing information that could bring potential developers to the table. Our intention was not to get in the middle of a potential land transaction, but to entice one. So, the playbooks are really intended to give a very broad brush of various potential assets and liabilities that developers need to begin to consider a site for purchase and develop an investment proforma. 2. What does a typical playbook include, and what are the next playbooks shaping up to look like? The playbooks include a Phase I environmental site assessment, which is a basic product that nearly every bank requires to lend on a property. It also includes a potential cost estimate for demolition and abatement of the plant. We also identified all the existing permits associated with the plants in the event any of them could be utilized by an end user. Also important was a catalogue of all the existing utilities, including their condition. We also sought to understand if there could be a new energy story for these particular plants. Is there some value in what is existing at the site, either through existing utilities or transmission infrastructure, that could lend itself to a new energy use as part of a redevelopment scenario? Along with those items, we also focused a key part of the playbooks on assessing the highest and best use each decommissioned plant given the regional economic development backdrop. So, in our first playbook for the Mitchell Power Station, we ended up looking at three distinct development scenarios. The options vary. Most of them are either commercial and/or light industrial based on the past use of the property and where the property is located. All this information is then bundled into a comprehensive report that is public and can be handed to any interested developer and/or potential end user so that they can quantify what their level of investment might be to get the site to where they can reuse it. The next one that we’re looking at is Sunbury Generation, which is in Snyder County. This site has a both decommissioned coal-fired power plant, as well as new 1,000 MW natural gas-fired power plant. We are looking at the balance of the property for redevelopment opportunities, which is about 100 plus acres. The other one is Cromby Generating Station, which is just outside of Phoenixville in Chester County. 3. Obviously putting this playbook together was a team effort, led by the great folks at Civil & Environmental Consultants, with some of us at Buchanan Ingersoll and Rooney even having a role in its development. Can you tell us a bit about what went into making this playbook possible and how you think it will help aid in the identification and redevelopment of other sites across not just Pennsylvania but the U.S. in general? The process for the first playbook took about six months, and there was definitely a learning process. We not only included the actual power plant site, we included an adjacent site opened by a different company that added another 900 acres. Buchanan aided greatly because they have a lot of industry experience in natural gas. We certainly needed that background information to look at potential end-use scenarios and how they might apply in Washington County, which has this rich resource of natural gas and natural gas liquids. Buchanan was able to provide the insight necessary to help to define end-use strategies that may tie to that particular industry. 4. How is the state of Pennsylvania working to combine the need for regulation and the need for permitting with the goal of making it easier for companies to revitalize these energy facilities? Governor Tom Wolf is committed to ensuring that we have economic development that goes hand-in-hand with environmental permitting. Pennsylvania has one of the best brownfield programs in the nation, and the reason we have that distinction is because our voluntary cleanup program was the first in the U.S. We’ve been doing this for 25 years, and the staff at the Pennsylvania Department of Environmental Protection (DEP) that work on brownfields absolutely understand how critical liability relief is to enable redevelopment. Pennsylvania has very committed staff in both DCED and DEP that understand the link between cleanup and economic development that will happen at a property. Nobody wins if the site sits idle. The governor is always seeking improvements in permitting and how it relates to economic development in general. 5. The playbook aside, what other initiatives are you working on? What should job creators and taxpayers be looking forward to as it relates to energy? Probably the biggest thing that we’re looking at, which is very important to our long-term economic development potential, is the development of downstream industries associated with natural gas and natural gas liquids. We have been spending a lot of time looking at ways to keep the use of that natural resource here in the state. Currently, we estimate that 75-80% of our natural gas is exported to other markets beyond Pennsylvania, and that could be domestic or international. With regard to natural gas liquids, we are exporting 100% of our ethane. That will only change when Shell Pennsylvania Chemicals comes online in Beaver County in the next few years. Our desire is to find more ways to use natural gas right here in Pennsylvania. We’re looking at opportunities to use natural gas in heat and power generation, as it would help bolster our manufacturing base, so they can use energy more efficiently, closer to the source, and at a lower cost. On the production side, we see tremendous opportunities for natural gas liquids in the petrochemical manufacturing sector. Developments in that area lead to other downstream industrial opportunities even in areas as advanced manufacturing and robotics. So, that is really a key area for us right now – expanding in-state use for natural gas and natural gas liquids. 6. In March of 2018, Governor Tom Wolf announced the extension of the Tri State Shale Coalition (TSSC) Memorandum of Understanding with West Virginia Governor Jim Justice and Ohio Governor John Kasich. Why was it important for the energy industry that this agreement was extended, and what will it bring to the Commonwealth? The original agreement was signed in October of 2015, and it was probably one of the best things these three states could have done to shore-up the possibility for additional investments in the region’s petrochemical sectors. At the time, there was a recognition that there were certain world-class ethane crackers looking to locate in the region. One of them was Shell (Pennsylvania), and the other is PTT Global Chemical (Ohio). The governors of those three states agreed that it’s better to support the long-term development of the Marcellus-Utica shale basin, and then secondarily, to work on individual economic development strategies. It will take 6,000 workers to build Shell Pennsylvania Chemicals and they will not all come from Pennsylvania. They will come from throughout the region. The same is true of permanent, full-time employees of the plant, of which there are around 600. There will be a regional draw to fill those positions. So, the focus needed to be bigger than any individual state. It needed to be on the region as a whole, because we all have the same thing at stake. We are trying to raise the potential for investments here as opposed to exporting the resource other places where the jobs will follow. The MOU was extended until December 31, 2021. The three governors recognized that it was vital to continue the good work the TSSC was doing. We’re working together in a number of key areas. We’re collaborating on national and international marketing efforts, research and innovation, transportation and infrastructure, and workforce development. Those key platforms are critical to developing economic development opportunities in the broader region. 7. A challenge that we’ve heard repeated is that Pennsylvania and surrounding states lack adequate sites or the very least a database of sites for potential downstream projects. How much of that is real or perceived or is it somewhere in the middle? It’s true that a common challenge facing Pennsylvania, Ohio and West Virginia is the perceived lack of available sites for new petrochemical manufacturing facilities. Part of the perception issue is related to how our landscape looks when compared to the landscape of the United States Gulf Coast. We are an area of rolling hills and valleys, of sinuous rivers and roads – which can appear challenging to potential developers if they are not accustomed to engineering sites in our region. Shell Pennsylvania Chemicals (Monaca, Pennsylvania) and PTT Global Chemicals (Belmont, Ohio) have found sites in our region that worked for them, so we do not believe that we lack an available inventory. There may be a challenge at times in identifying those sites, but they certainly exist without a doubt. Our approach is to work closely with companies who want to invest here and to provide a tailored site development strategy to meet their needs. Buchanan, Ingersoll & Rooney – along with other professional service companies that play critical roles in development – recently launched the Energy 2 Economy Initiative (E2E) during a media and stakeholder event that DCED hosted earlier this year. It’s really the private sector’s response to the TSSC to make sure our region can attract new investments. Among other solutions, E2E developed a unique site selection tool that uses GIS and artificial intelligence to identify and combine parcels, including those properties not actively listed, and overlays critical infrastructure availability to give developers a complete look at their options in the region. Rather than approach site development from the “top down” (starting with a list of available properties for sale), they designed a tool that allows a developer to approach site selection from the “bottom up” (identifying potential sites through a need-based process – acreage, infrastructure, etc.). This tool helps to conduct site selection from a more customer-centric standpoint. We’ve not seen a tool quite like this and we believe E2E gives our region a distinct advantage in attracting job creators from across the globe. 8. We hear a lot about how there’s a tremendous amount of energy innovation happening in Pennsylvania and most significantly around the Pittsburgh area. In what was once a region known for its steel and coal, what’s driving that innovation? I would say the Pittsburgh region, as a whole, is becoming an energy ecosystem. The history of Pittsburgh, with its roots in steel and coal, and now with natural gas on the rise, is being combined with innovative technology on the renewables front. So, if you look across the entire sector of energy, Pittsburgh is working in every piece of it. And this is why I think they will make a mark of distinction in energy innovation. The Energy Innovation Center at the University of Pittsburgh is looking at ways of combining natural gas-fired combined heat and power systems with renewables in the same space. That’s very forward-thinking, and that pushes not just the energy frontier, but the environmental frontier as well. It’s looking at taking all the aspects of energy and combining them in the best ways possible to have lower costs from an energy perspective, more efficiency from a manufacturing perspective, and fewer emissions from an environmental perspective. We ought to all keep our eyes on Pittsburgh. 9. We have talked a lot about energy today, but one thing we didn’t mention yet is the momentum of support that’s gaining around an Appalachian Storage and Trading Hub. Can you talk a little bit about that? Underground storage is something that the United States Gulf Coast has with salt caverns, where ethane is stored underground. So, during plant shutdowns or times when less ethane or more ethane may be needed, they can move and transport from storage into the actual plant. In the Appalachian basin – Ohio, West Virginia and Pennsylvania – we currently do not have any underground storage locations. So, for example, Shell is building a 93-mile pipeline, and they have 10 ethane suppliers that will ensure they have the ethane when they need it. But for additional world-class ethane cracker investments like Shell Pennsylvania Chemicals, the three states believe that a natural gas liquid storage hub is a critical piece of needed infrastructure. West Virginia University is leading the research related to where there could be feasible storage hub facilities, and they’re developing a public-private partnership for the development of a storage and trading hub in concert with a federal loan guarantee application through the Federal Department of Energy. There has been a lot of talk of it lately – Pennsylvania State Senator Camera Bartolotta and State Representative Jim Christiana just authored a resolution to the federal government to support the development of an Appalachian Storage and Trading Hub. This demonstrates a shared sense of responsibility to ensure Pennsylvania is not simply producing feedstock that is sent elsewhere for additional processing and manufacturing. These raw materials are the building blocks for additional long-term economic development. This is truly an exciting time to be working in the energy space. We can transform our economy by harnessing our energy resources and developing the next advanced manufacturing revolution.